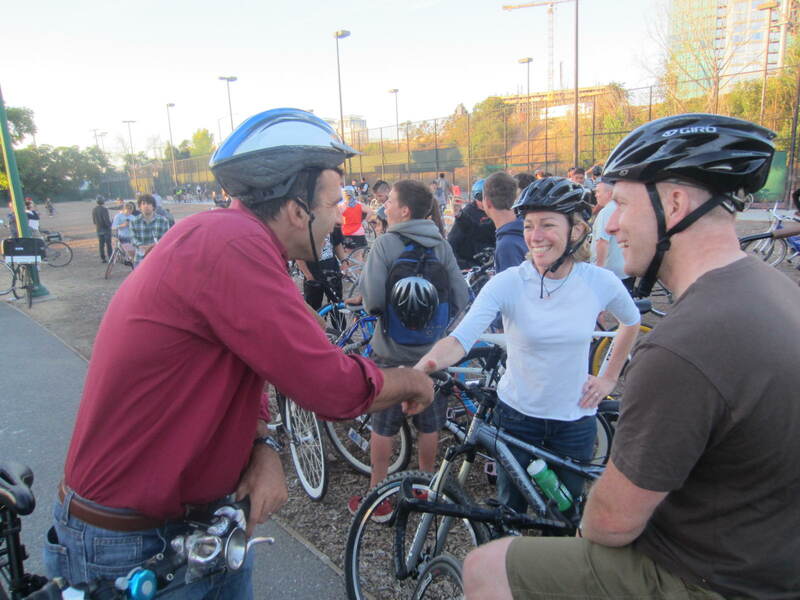 San Jose Mayor or City Council candidates Sam Liccardo, Raul Peralez, and Don Gagliardi all made appearances at last Friday’s San Jose Bike Party, pitching improvements to bicycling conditions on the city’s streets as integral to public safety. An estimated 2,500 Bike Partiers rolled out from Arena Green Park in downtown San Jose on the 18-mile, patriotically-themed “Stars & Stripes Ride” through the city’s East Side. The June 3 primary election narrowed the field of 30 candidates down to eight candidates, competing for four seats on San Jose’s City Council: Mayor and Districts 1, 3, and, 7. Council races for Districts 5 and 9 were determined on June 3: Challenger Magdalenda Carrasco received 53 percent of the votes cast in District 5 (eastern San Jose), and incumbent Donald Rocha won 74 percent of the votes cast in District 9 (south San Jose), each above the 50 percent threshold to avoid a runoff election on November 4.
http://youtu.be/_bxg_2gzHnoPeralez’s opponent, attorney Don Gagliardi, who took second on June 3 with 24 percent of the votes, claimed to be “the candidate for making San Jose a bicycle Mecca,” and applauded Bike Party attendees “for being out here tonight and working on that task.” He also pitched History San Jose’s free exhibit on the city’s bicycling history, which opens this Sunday, July 27. 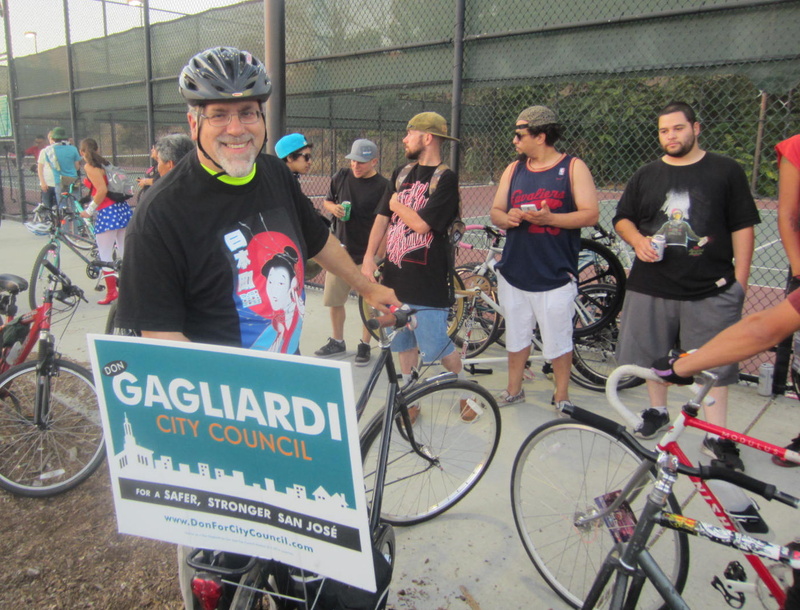 Gagliardi, who campaigns at San Jose Bike Party each month with a lawn sign mounted on the rear of his bike, has been promoting the exhibit for several months. Mayoral candidate Sam Liccardo pointed to some major improvements he has supported as a councilman since 2006, when he was elected to represent downtown’s District 3. Santa Clara County Supervisor Dave Cortese, who finished first among candidates for Mayor in the June 3 primary election, was represented at Bike Party by his campaign staff, along with a crew of cheering volunteers — the largest in support of any candidate at the bike ride. Cortese spoke at San Jose Bike Party on May 16, along with several other candidates. Volunteers also organized a “Bike Polo Exhibition” on one of the tennis courts in Arena Green Park, demonstrating the sport to ride attendees. Bike polo has attracted a small but dedicated community, meeting at the park on most Wednesdays and Sundays. Organizers hope the city will create “multi-use courts” suitable for both tennis and bike polo, with some minor modifications to the courts. It’s a wonder they don’t have their helmets on backwards.